I tried two varieties: Strawberry and Brown Sugar Cinnamon. These taste exactly like you'd expect them to taste. They're just like their non-whole grain counterparts except they have more of a whole grain taste. The strawberry variety made the best transition to whole grain. It reminded me a little of strawberry jam on whole wheat bread. It was nice... a Pop-Tart with more of an adult taste. The brown sugar cinnamon variety doesn't fair as well in it's whole grain casing. The flavor has less of a contrast to the wheatey crust than the strawberry filling. There's less going on to entertain your taste buds. The flavors just sort of meld together to create a dull flavored-whole grain taste. Buyer beware: When you see a stalk of wheat on food packaging, it's easy to assume you're looking at a healthy product. Don't assume that here. The box boldly proclaims "one serving of whole grain". What is a serving of whole grain? It's meaningless, no matter what the government says. To derive benefits from whole grains you have to look at the amount of dietary fiber you're getting. These Pop-Tarts provide a paltry 3 grams of dietary fiber per serving. A bowl of Grape-Nuts provides 7 grams per serving. To make matters worse, a serving of Pop-Tarts is not comprised of both of the pastries that come in each shinny metallic jacket. A serving is one single Pop-Tart. Each serving has 190 calories and 35 grams of carbs. I believe that most people take the serving size to be two pastries... that's what comes in the package... that's what fits in your toaster. Tell your friends not to make this mistake, unless you hate them and want them to eat 70 grams of carbs for breakfast. The bottom line: These Pop-Tats taste mildly alright and they're not all that good for you. 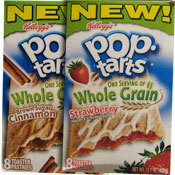 What do you think of Whole Grain Pop-Tarts? These are the best things I've ever eaten. This was awful. I love whole grain breads and flours... and I also have a love for cinnamon... but these were off. 4 eggs is high for these in my book. The whole grain pop tarts provide 5g. of dietary fiber per serving (10g. per package) and taste great if you like the whole grain taste. The point is not that overall it is good for you but rather it is better for you than the regular pop tarts. If somebody makes a fat free product that tastes great but still has the same amount of calories, it is still better for you because of the lower fat despite providing the same caloric intake. 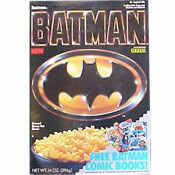 Wow I saw and ad for these and ripped it out of the magazine thinking I'd buy them the next time at the store. Now I won't! Thanks for the heads up!